David Meltz has a beef with a state agency. 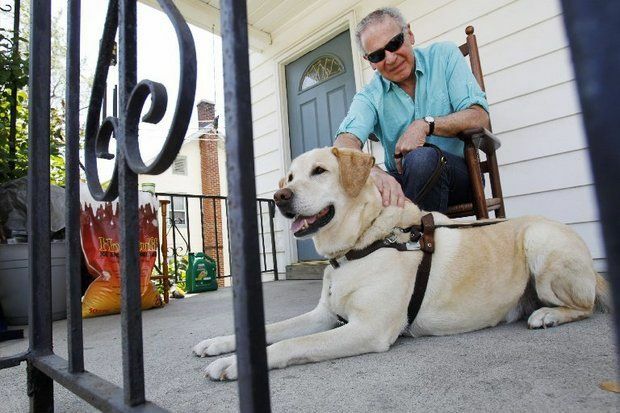 Meltz is both deaf and blind, and he receives state services from the New Jersey Commission for the Blind and Visually Impaired (CBVI), which is part of the Department of Human Services. In the past year, Meltz, 62, of Washington, said his already serious hearing loss worsened. He has Usher Syndrome, which according to the National Institutes of Health is characterized by progressive hearing loss and an eye disorder called retinitis pigmentosa. Meltz has lost about 70 percent of his hearing, but compared to others with the condition, he said he’s fortunate because he’s retained some vision and some hearing. Doctors have told Meltz, who used to work as a school psychologist, that he’s not yet a candidate for cochlear implants. Better hearing aids would be his most realistic option, he said. For example, he said, with his current set of hearing aids, female voices often sound like Louis Armstrong. But there’s a hearing aid with technology that cleans up those distorted sounds. An audiogram, performed in January, confirmed the drop in his ability to hear. That made him a candidate for new hearing aids that would help with his specific kind of hearing problem. He said his audiologist sent the test results and a proposal for new hearing aids to CVBI on Feb. 5. When Meltz didn’t receive a response, he emailed his case manager, records show, and the case manager replied that she hadn’t received the request. So the audiologist resent the paperwork on March 3. The case manager said via email that she would process the request immediately. But as time passed, Meltz didn’t receive any word. So he contacted his case manager again. More time passed, and nothing happened. Meltz said he knows there have been cutbacks throughout state government, but that doesn’t change his need or the stated mission of CBVI. CBVI, which has a budget of more than $27 million, provides its mission statement on its web site. Meltz says that’s an overstatement, and in his experience, service levels have plummeted since 2010. He said he’s concerned not only about himself, but about others who may not be receiving services for which they qualify. We wanted to know more about the agency, how it spends its money and how many New Jerseyans it’s tasked with helping. And how many of those people are on waiting lists, like Meltz. We reached out to CBVI on Meltz’s behalf, and in two business days he received an email from his case worker. We reached out to CBVI to see if Meltz’s assumption was right. Was he moved ahead of others on the waiting list? How many people are on the list? How long does it usually take? Ronan said since the start of the state’s fiscal year, which began July 1, 2014, CVBI has helped 8,745 people, which includes consumers receiving services from all of its programs: Education, Vocational Rehabilitation, Independent Living Services, and Eye-Health and Related Screenings. In that same time period, she said, the state purchased 15 sets of hearing aids for consumers. “There are four deaf-blind consumers whose hearing aids requests are in process – we believe that they should be received by mid-June,” she said. She said once all the paperwork is completed, the wait can depend on the hearing aid type and manufacturer. It usually takes about two months, she said. She noted that CBVI didn’t receive Meltz’s paperwork until March — which is what Meltz said, though he reported the paperwork was sent the first time on Feb. 5. She also said that Meltz has received other services, including a laptop and training to use adaptive software, new glasses and a previous set of hearing aids. Meltz said he’s grateful for the services he’s received, but he disagrees with some of CVBI’s comments. Next, Meltz said he understands that CBVI needs to review the request, assure the device meets standards and pricing. He said in his experience, once ordered, most hearing aids are in the consumer’s ear within a week. Meltz said he’s noticed a difference in service time in north Jersey compared to the help he received from the south Jersey offices.